Nitya Chambers’ (DC 2001) career takes her to places where the world’s history is being written. As the first digital news hire at ABC News’ Washington, D.C. bureau, she shaped how stories were told throughout the 2008 presidential election. In her current role as vice president for content development at CNN Digital Worldwide, Chambers was part of the executive team that produced “Explore Parts Unknown,” the online home for the acclaimed series starring the late Anthony Bourdain. Her team won the Emmy Award for Outstanding Short Form Nonfiction or Reality Series for the project last fall, making Chambers the first graduate of Carnegie Mellon University’s Dietrich College of Humanities and Social Sciences to win such an award. The History Department alumna said Anthony Bourdain drew a diverse audience who appreciated his vision of the world and the way he explored it. Winning the Emmy for a series on immigrant neighborhoods outside of Los Angeles was powerful and personal to her. “I felt like those were the types of stories that I came to journalism to tell,” Chambers said. A Pittsburgh native, Chambers entered CMU as a physics major. But an elective course with former faculty member Susan Ambrose (DC 1986) sparked her interest in history and anthropology. “It really was this moment where a lot of things I loved came together. I loved the way that she taught, the things she was asking us to think about and the way that she connected the past to the present,” Chambers said. By her junior year, Chambers had changed her major. She credits her studies with helping her to effectively navigate organizational change. While at CMU, Chambers took a management communication course at the Tepper School of Business from Chad Hermann, who became a mentor and close friend. Hermann coached her as she prepared to deliver CMU’s student commencement speech in 2001, and he later encouraged her to pursue a master’s degree in journalism. “He saw in me something that I love to do, which is write and speak. He gave me a vehicle for putting that in the context of a business world,” Chambers said. During graduate school at Boston University, she joined ABC’s “Nightline,” anchored by Ted Koppel, and stayed with the program through its transition to a multi-anchor format. She then moved to ABC News’ Washington, D.C. bureau and was recruited to launch the network’s digital coverage of the 2008 presidential campaign. Chambers said that experience show her the importance of bringing developers to the table at a beginning of a project, the role design plays in conveying brand and stories, and what user experience can do for the way a consumer engages with a product. In addition, CMU’s culture helped her to build a foundation for navigating the intersection of content, technology and design. Beyond courses in her major, Chambers took a programming class and learned to set up a basic website in the university’s required computing course. That background also includes the financial side of the business. “Learn what the revenue models are, how they work and how to read a financial sheet,” Chambers said. She also encourages students, regardless of their major or future plans, to take on creative challenges during their undergraduate experience. Chambers is excited by the momentum of digital storytelling across the industry and at CNN, which celebrates its 40th anniversary next year. 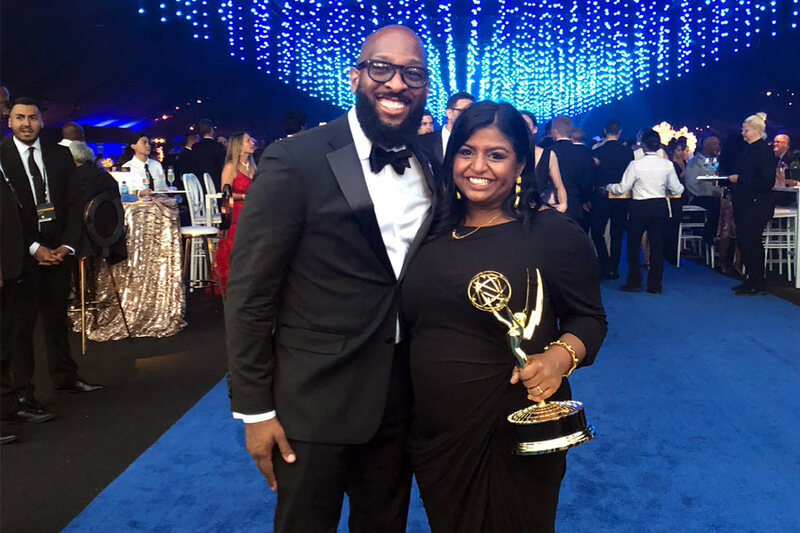 Pictured above: Nitya Chambers (DC 2001), right, and her husband, Mark Chambers (A 2001, HNZ 2002), left, celebrate her Emmy Award win in September 2018.